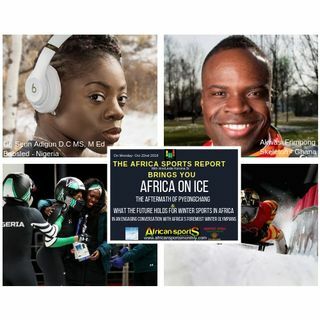 The Africa Sports Report Podcast Show Brings you an engaging conversation with Africa's foremost Winter Olympians Dr. Seun Adigun (Captain of Nigeria's Bobsled Team) and Akwasi Frimpong (Skeleton Athlete for Ghana) about the Future of Winter Sports in Africa in the aftermath of the 2018 Pyeonchang Winter Olympic Games in South Korea where both Athletes debut as Winter Olympians and made their mark representing Africa and their individual countries of Nigeria and Ghana respectively. ... Más informaciones Both Athletes are Pioneers and Trailblazers who are true Go-Getters. Find out what they are working on behind the scenes these days in our engaging conversations.